Mark your calendars and register to Struttyour Mutt at the 1st Annual Mutt Strutt dog walk benefiting Tailwaggers 911 Dog Rescue. This furry fun-raising event will be held on Saturday, October 2nd. Registration is from 10 am – 11 am and the walk is from 11 am to 4 pm in Port Washington, WI at the Upper Lake Park. Stick around and enjoy the activities, contests, refreshments and shopping after the walk. Cost is only $15.00 per adult and $10.00 for children under 12. Online registration must be completed by Midnight Saturday September 25th to guarantee a shirt the day of the walk. You can still register online after September 25th but you will not be guaranteed a shirt on October 2nd. Ah, with the arrival of my sister in town from Colorado, I knew my Louie dog would be in need of a bath. You see, he has this habit of hopping in bed with houseguests and snuggling right up to them. 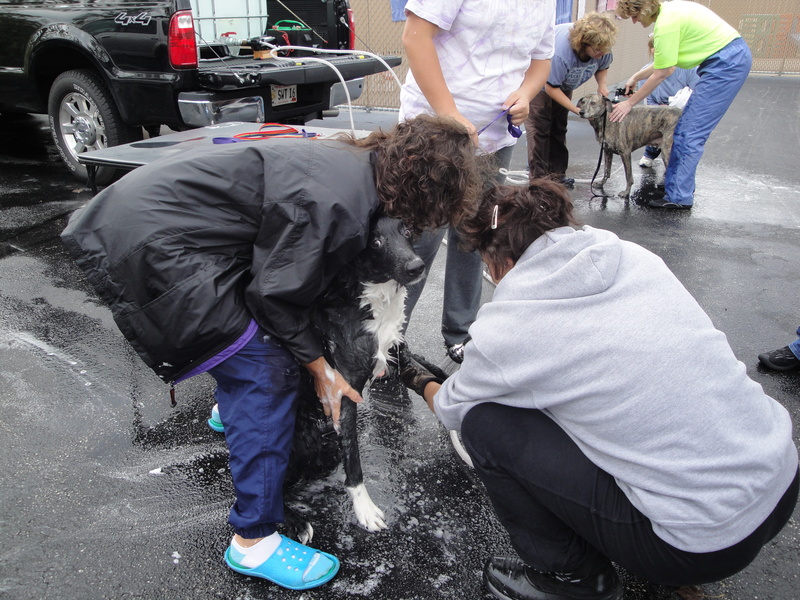 So, as luck would have it, the great folks including Mark and Karol of Central Bark Muskego were having a benefit Crate and Dog Wash this past Saturday. It was a benefit for LEARN, the Labrador Education and Rescue Network. Now Mr. Louie is not the happiest camper while getting a bath. He will give half-hearted attempts to wander away from you. And, ears will be drooping looking like he just got yelled at for licking out the last of the peanut butter from the jar. And, since, it is usually me giving him a bath or him getting one at doggy day care, I took this opportunity to click a few pics. 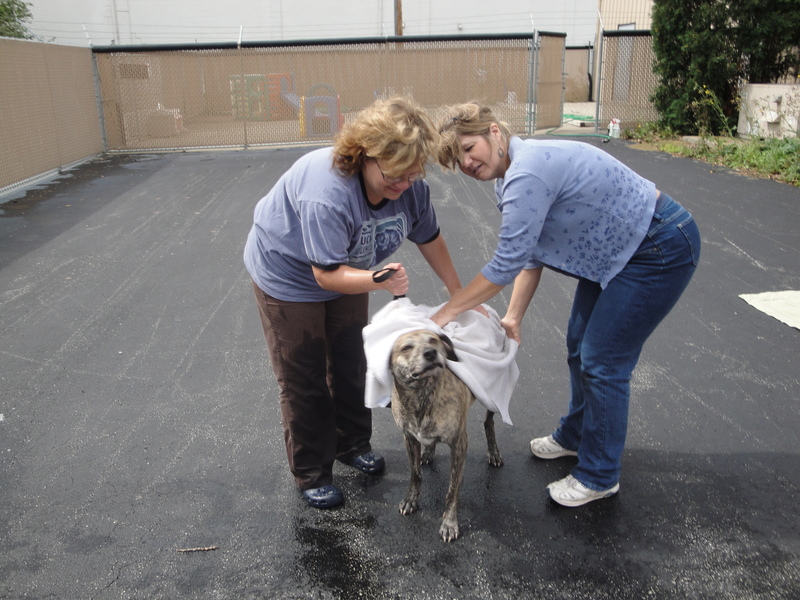 While Louie was getting scrubbed up another dog was also reluctantly getting a bath. I got a chance to talk to the wonderful owners of Central Bark Muskego, Mark and Karol. Their cute French Bulldog offered up her version of a puppy facial to me all the while making what can best be described as little “snarkling” noises. What a sweetie Mona is! While she was a bit too quick for the camera, I did manage to snap a pic of Mark and their Frenchy foster, Manso. Manso is looking for a forever home. And, while Mark and Karol would love to keep him for themselves, it is against the rules of the rescue. Learn more about Manso at www.centralbarkusa.com/locations/muskego.html . Manso is looking for a forever home!! So, Louie ended up clean and fresh-smelling, but more importantly, hopefully the LEARN team earned some cash to help their organization. Find out more about them at http://www.labadoption.org ! Humane Society of Waupaca County would like to invite the community to join them for a fall walk, rain or shine, on October 2nd to benefit the HSWC Adoption Center and help care for all the animals currently in residence there. You may walk with or without a pet for the small admission price of just $10 per person or $20 for a family. As in many previous years, the walk will be held at the Miller Farm, E720 Frost Valley Rd. The scenic walking trails wind through the prairie fields and along the Waupaca River. The walk begins at 9:30am, but walkers are invited to arrive at 9 and enjoy coffee provided by the Waupaca County Coffee Company and treats made by HSWC Volunteers. Pledges are encouraged! The adult bringing the highest total in pledges will receive a $50 gift certificate provided by T.W. Martins Public House. A pool party certificate donated by the Village Inn of Waupaca will be awarded to the child/student bringing the most pledges to the event. HSWC cares for approximately 1000 dogs, cats and other small animals every year and relies on donations from the community to cover expenses. This year’s Walk for Wags and Whiskers is also being brought to you by some generous sponsors: Sweet Medicine Prescriptions Plus, Pfeifer Properties, Mobil Travel Plaza, Shambeau & Thern Real Estate, Gusmer Enterprises, Inc., and Countryside Animal Hospital. For more information, please visit the website, www.waupacahumane.org or call Edna at 715-258-5127 or the Adoption Center at 715-258-2545. HAWS CELEBRATES FALL…AND OUR ALUMNI! 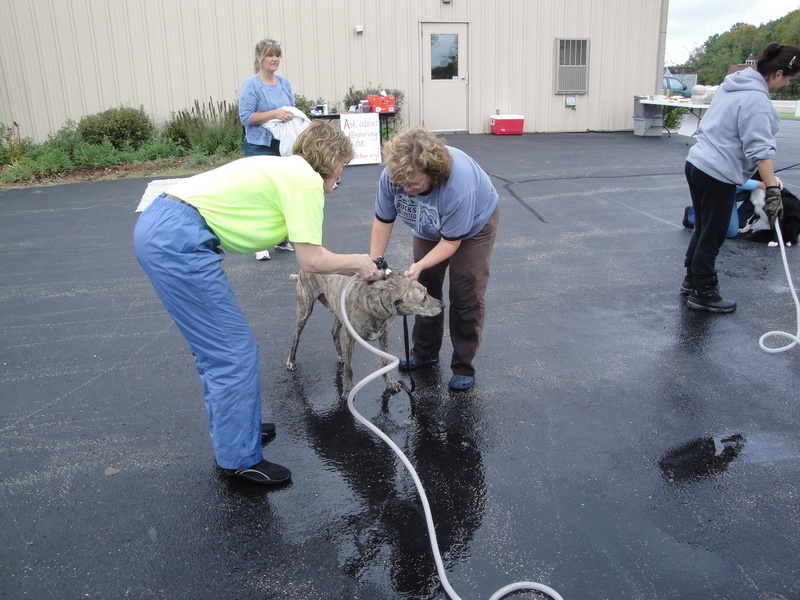 WAUKESHA ­­— HAWS, the Humane Animal Welfare Society of Waukesha County, Inc. welcomes fall with a full calendar including the annual meeting, many classes and seminars, Mobile Adoption visits and more…all leading up to the fall fundraiser, HAWS Homecoming 2010! HAWS Annual Meeting is Monday, September 20th at 7:00 p.m., featuring the year in review and election of new board members. Everyone is welcome, voting is by membership only. Mobile Adoption Center events include two very special visits: Dog Day Afternoon on Sunday, September 12th at the Waukesha Expo Center grounds, and a September 18th day of fun made possible by the teamwork of Noodles & Co., Petco and Maurices at the Shoppes at the Fox River (Sunset Dr., Waukesha ). HAWS Mobile unit brings happy tails to neighborhoods throughout the Waukesha County area! Various 6-week canine obedience classes begin on September 8th, 11th and 16th. Guinea Pig and Rabbit Pedicures are available for a donation on September 18th. “Keep Your Puppy and Your Sanity” with a free seminar on September 19th. The monthly First Aid for Pets class is September 25th. Meet a greyhound and learn about adoption through the HAWS-GPA partnership on September 25th. Details, locations and registration (as needed) for all events can be found at www.hawspets.org on the “Upcoming Events” page, or call HAWS at 262-542-8851. Not to be missed is the annual fall fundraiser, HAWS Homecoming 2010! Celebrate our Alumni with a football-themed party, featuring a Homecoming Court of adoptable pets; festive parade; ‘fan’-tastic food, silent/live auctions and casino gaming. Watch the UW vs. Ohio State game at the event – and win the big-screen TV in the raffle! General admission and VIP tickets for HAWS “big game” are now available, as are parade floats and additional sponsorships. Call 262-542-8851 or visit hawspets.org. HAWS, a non-profit organization established in 1965, assists over 6,000 animals each year and welcomes more than 31,000 human visitors to our shelter annually. As an “open admissions” shelter HAWS assures sanctuary for animals in need, while offering educational programs and services to promote responsible pet ownership and prevent animal abuse. The shelter is located at 701 Northview Road in Waukesha , Wisconsin . For more information call (262) 542-8851 or log onto www.hawspets.org. Visit us at “HAWS Waukesha ” on Facebook! WAUKESHA ­­— HAWS, the Humane Animal Welfare Society of Waukesha County, Inc. teams up this weekend with the Shoppes at Fox River, Sunset Drive in Waukesha , for a day of fundraising, awareness and fun. Shop and dine all day to help the animals at HAWS! This Saturday, September 18th, HAWS’ Mobile Adoption Center “sets up shop” for the afternoon at the center’s common Pavilion for a meet’n’greet of pets available for adoption from HAWS. Petco of Waukesha, a great new friend of HAWS located at 1240 W. Sunset, will be setting the mood with a DJ, special promotions and fun for all – pets and people. Also on Saturday, Noodles & Co. sponsors a benefit dining event from 12:00 – 8:00 p.m. Have lunch or dinner at their restaurant at 1210 W. Sunset in Waukesha , mention the HAWS fundraiser, and 25% of sales will be donated to HAWS! The special day wraps with the “Rescues & Runways” Fashion Show, presented by Maurices of the Shoppes at Fox River . This benefit for HAWS, beginning at 6:00 p.m. in the Garden Pavilion area, will feature fall styles, a silent auction…and some very special HAWS alumni strutting their stuff with the Maurice’s models – in pet Halloween costumes provided by Petco – Waukesha . HAWS Mobile Adoption Center brings happy tails to neighborhoods throughout Waukesha County ! And don’t forget, HAWS’ annual fall fundraiser, HAWS Homecoming ‘10 is only a month away: Celebrate HAWS’ current and future alumni with a football-themed party, featuring a Homecoming Court of adoptable pets; a festive parade complete with floats; ‘fan’-tastic food buffets, silent/live auctions, casino gaming and more. Watch the UW vs. Ohio State game at the event and even win the flat-screen TV! General admission and VIP tickets for HAWS “big game” are now available, as are parade floats and event sponsorships. Call 262-542-8851 or visit hawspets.org. HAWS, a non-profit organization established in 1965, assists over 6,000 animals each year and welcomes more than 31,000 human visitors to our shelter annually. As an “open admissions” shelter HAWS assures sanctuary for animals in need, while offering educational programs and services to promote responsible pet ownership and prevent animal abuse. The shelter is located at 701 Northview Road in Waukesha , Wisconsin . For more information call (262) 542-8851 or log onto www.hawspets.org. Visit “HAWS Waukesha ” on Facebook! Consumers can contact Hartz at 1-800-275-1414 at any time with questions.